The days are getting longer, and time is just flying! Now we have already had this year’s spring equinox. The equatorial plane of the Earth passed through the centre of the sun on Wednesday (20 March) at 21.58 hours (UT = universal time = GMT). From now on, the days are longer again than the nights on the northern hemisphere, and the further north you are, the more light and the less darkness. 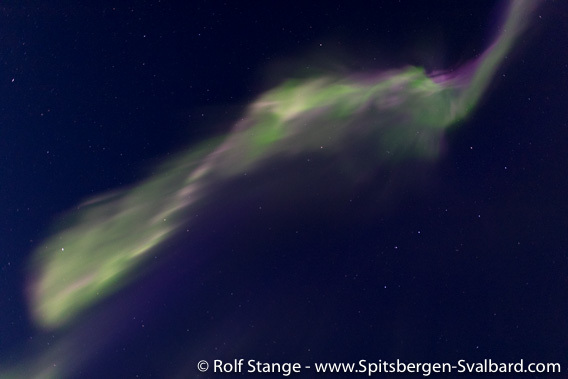 This means that the current northern light season in Spitsbergen is now slowly coming to an end. On Saturday (16 March) we had another amazing celestial performance. A stunning aurora borealis, intense, vibrant, fast. 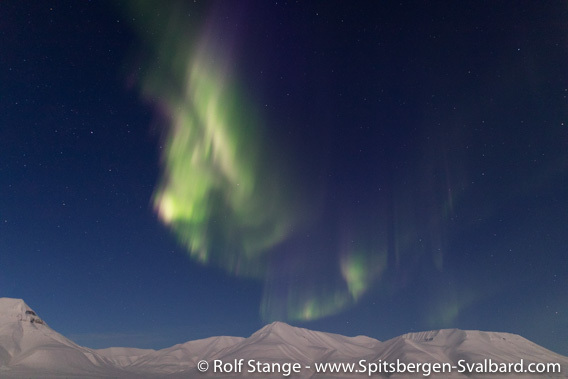 The northern light season in Spitsbergen is now coming to an end. This northern light was definitely above average! To capture the very fast movement, I used shutter times of up (or, rather, down) to 0.3 seconds, and even that was probably too slow to capture the filigrane, but very lively structures (click here to read more about northern lights and how to photograph them). Aureole (or dome) of northern light above Adventdalen. The last days were full, there was just no time to write new blog entries … there will be more soon. ← Solfest: Sola er tilbake - the sun is back!